The Greeks used it to describe the wind. More recently we use it to describe the wispy effects of the Northern Lights. Either way, boreas, or borealis as we say today, has a long history of denoting wild, smooth, and powerful movement throughout nature. It is something that was taken notice of when introducing the newest graphic to the Shoei Neotec lineup. 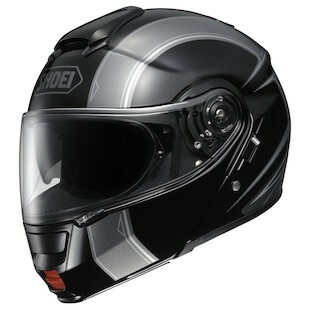 The Shoei Borealis Helmet is a graphical update to one of the top modular helmets in the world, the Shoei Neotec. With a Black/Silver color scheme that would make Howie Long proud, this helmet rocks a racing-stripe styled graphic that runs from the chinbar to the back of the helmet where it extends out in a clawlike grasp at the neck. Light accents within the stripes make the design really pop off of the black finish. For a top-flight modular helmet with a little more pizazz than your standard solid color, check out the Neotec Borealis from Shoei.